In June 2014 Peter Kimberley, the owner of the New Kimberley Hotel in Blackpool, was jailed for 18 months and ordered to pay £5,243 in costs after being found guilty of 15 breaches of fire safety regulations. His 90 room hotel, when inspected by Lancashire Fire and Rescue Service, was found to have fire exits blocked with combustible material, fire doors were locked shut, and there was insufficient water available to fight fires. The New Kimberley Hotel, described in court as ‘a death trap’, was shut down. But Mr Kimberley wasn’t a bad chap – just an unlucky one in his choice of career. If instead of being a hotelier Mr Kimberley had been the Governor of a prison where exactly the same, and worse, fire safety failures had been discovered, he would not have even been arrested. Certainly he could never have been charged, tried, convicted and sent to his own jail – because every prison in England and Wales is immune from prosecution when it comes to fire safety. All prisons are Crown property, and as all criminal charges in England and Wales are brought on behalf of the Crown, the Crown cannot prosecute itself. All that the relevant authorities can do is issue Non-Compliance notices and Crown Enforcement Notices. ‘Crown Immunity’ is a nifty bit of legal footwork that allows the Crown to commit exactly the same type of offences with impunity, that see others like Mr Kimberley packed off to prison. If only our prisons really were the ‘hotels’ many ill-informed people wrongly believe them to be. I have been the editor of The Prisons Handbook for England and Wales for over 20 years and yet the issue of fire safety in our prisons had never really crossed my mind until one awful day six weeks ago. Largely I think it was because fire safety is not mentioned in any inspection report from HM Inspectorate of Prisons (HMIP) – despite the fact that one of its four ‘Healthy Prisons’ tests specifically refers to ‘Safety’ – indeed the new ‘Expectations’ document that comes out next month, on which all prison inspections are based, doesn’t even mention the word ‘fire’ once. There has never been a Parliamentary inquiry into fire safety in prisons I can find, and until 2006, after the Regulatory Reform (Fire Safety) Order 2005 came into force, there were no fire regulations covering prisons at all – none. And then, on 14th June this year, for me Grenfell Tower changed everything. The horrific towering inferno that we all watched on our televisions as fire took hold of the cladding and destroyed the building in what seemed like seconds, is a scene I will never forget – it was at that point the prison penny dropped: our prisons have cladding; what if…? I contacted Peter Clarke, HM Chief Inspector of Prisons, and asked him whether in light of Grenfell HMIP had taken any action to inspect fire safety in our prisons? The Chief Inspector replied saying simply that fire safety in prisons was not his bag. Inspecting prisons for fire safety he said was the remit of a little-known independent statutory Inspectorate: the Crown Properties Fire Inspection Group (CPFIG) – a part of the Home Office. As an independent inspectorate I searched online for CPFIG prison fire inspection reports; there were none. I submitted a Freedom of Information request to CPFIG and within 14 days the 19 prison Fire Safety reports on prisons produced by CPFIG in the year to June 2017 all arrived and I began to read. What I found was deeply troubling. Of the 19 CPFIG inspections in the year to June 2017, every single one had failed statutory fire safety tests and all were issued with legal notices: the full list is at the bottom of this page. The fire risk assessment had not identified all the measures which are required to achieve an acceptable level of risk for prison staff, prisoners, contractors & visitors. The Personal Emergency Evacuation Plan (PEEPs) did not set out suitable and sufficient individual plans for the evacuation of people with disabilities and had not been reviewed when evacuation needs had changed. The existing smoke control arrangements for enclosed landing areas, corridor approaches are inadequate to prevent smoke spread to other cells in the event of a cell fire. Oh and in case you think these are examples of failures CPFIG found across the prison estate in the last 12 months, let me tell you they’re not. This is just a very limited list of failures (running to 18 pages) that they found in just ONE prison (Bristol) – they found similar or greater failings in every single prison they inspected in the year to June 2017. Unlike Grenfell, where its Management Organisation were said to have treated fire safety concerns with contempt, I have not found any evidence to suggest that prison governors are doing the same. On the contrary CPFIG told me that that when serious defects in fire safety are pointed out to prisons they always find a positive response and a willingness to correct them – it is the prison finding the resources to do so that is the problem, and a question of how things could ever have been allowed to reach the unlawful fire state they were found to be in, that often goes unanswered. Our prisons are in crisis, as the Prison Governors Association (PGA) made quite clear in a blistering attack on Government policy in 1st August 2017. This is all the more important because the PGA, unlike the Prison Officers Association (POA), is not known for its public attacks on government; usually they just get on with the job. Make no mistake, the PGA and its critical assessment is absolutely spot on, and I have told them so too. Our prisons are now in real danger of flipping into self-destruct. We have lost 7000 frontline staff in the last five years, many of them the most experienced of all who left under the Voluntary Early Redundancy Scheme (VERS) and, as a result, we have seen a haemorrhaging of vital custodial skills from our prisons that I suspect will take well over a decade to replace. True, staff numbers are increasing, but only 75 officers have been added in the last year, and as the PGA make clear they are often the wrong sort of person to do the job – a problem caused by the fact recruitment rests with the Ministry of Justice, while training rests with the Prison Service; that is completely irrational in my view – and that of the PGA. As staff numbers have fallen, the prison population has increased, and budgets have been savaged. It is in this atmosphere, where Governors becomes locked each day in a desperate scramble to make the staff available ‘pegs’ fit the operational ‘holes’, that fire safety becomes less of a priority than it should be. All the prisons inspected by CPFIG in the year to June 2017 were issued with Non-Compliance Notices, followed by 28 day warning notices, and CPFIG even issued Crown Enforcement Notices so serious were the defects they found in four prisons (Featherstone, Rochester, Pentonville and Wealstun which was actually served with three of them). But what’s the point, given every prison enjoys immunity from prosecution? Immunity that was not enjoyed, and rightly, by Mr Kimberley, nor by any other commercial buildings, non-domestic and multi-occupancy premises in England and Wales which are subject to inspection and susceptible to prosecution, fines and imprisonment. 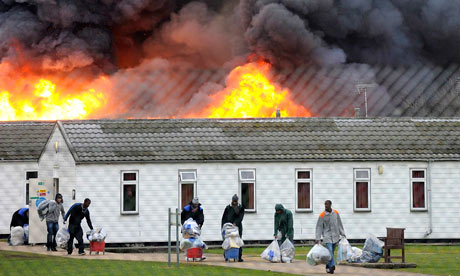 The shocking reality is that fire safety in our prisons is just not taken seriously. However, Prison Service Instruction 07/2017, issued just eight weeks earlier, and which covers the induction process doesn’t mention the word ‘fire’ once; even today it has still not been revised to take account of PSI 11/2015. What makes this worse, given that many failings identified by CPFIG in their statutory notices were due to ‘inadequate monitoring’, is that every prison has an Independent Monitoring Board (IMB), a statutory watchdog appointed by the Secretary of State for Justice (SOSJ) whose job it is to monitor what happens in our prisons and report to the SOSJ their concerns. Did the IMB report to the SOSJ the service by CPFIG of Non-Compliance Notices, 28-day warning letters or Crown Enforcement Notices about fire safety failings in their prisons? Did they monitor how, and if, the identified fire safety defects set out in the Notice were put right? When I compared the IMB Annual Reports of those prisons served with CPFIG Non-Compliance notices within the year in which CPFIG notices were issued, only one prison, Pentonville, made mention of it in its Annual Report (page 15) – the others seemingly airbrushed these legal documents out of existence. Were all IMBs even told at all? How are IMBs expected to monitor what happens in our prisons if they are given a sanitized version of reality by the prison itself? Governors must be mandated by Prison Service Instruction to copy all such statutory notices to their IMB on the date on which they are received; come on, its pretty basic stuff. And what of HM Prisons Inspectorate – why did they not pick up these dangerous fire safety failures when inspecting these prisons? The answer is sadly a simple one: they never looked – and they should have done. Had they done so they would not have issued the completely misleading report on HMP Coldingley that they did after their inspection there on 3rd March 2017. But that simply wasn’t true. Just 26 days after Peter Clarke’s Inspection gave Coldingley a ‘reasonably good’ safety rating, CPFIG came knocking on the prison’s gate – and they could not have disagreed more when it came to fire ‘safety’. They declared that when it came to fire safety HMP Coldingley was so dangerous they served the prison with a Statutory Non-Compliance Notice, giving them 28 days to correct the fire safety defects or they would issue a Crown Enforcement Notice. How on earth, less than a month earlier, could HMIP describe this as a ‘safe’ prison – a question I have asked the Chief Inspector? It is clear to me that the way we inspect and monitor our prisons is in need of fundamental reform. It currently consists of a series of ad hoc and separate statutory inspectorates, acting alone or scattered across government departments. The Care Quality Commission (CQC) inspects healthcare in prisons, Ofsted inspects training and skills, CPFIG inspects fire safety, IMBs report to the SoSJ, and HM Prisons Inspectorate itself which reports to parliament. We need is to bring them altogether, under one roof, and ensure the right hand knows what the left hand is doing. Currently CPFIG is part of the Home Office, HMIP are part of the Ministry of Justice, as are the IMB, the CQC and Ofsted are stand-alone inspectorates. As a consequence there is inevitable confusion between them as to what is actually going on. As Basil Fawlty would say “to state the bleedin’ obvious”, what we need is a joined up prisons inspectorate. We we only need one Prisons Inspectorate with experts across the disciplines. Grenfell changed everything – and yet in our prisons it changed nothing. Yesterday, 4th August 2017, there were 86,353 people locked up in our prisons (leaving room for just about 750 more before full operational capacity is reached). On top of that we have (March 2017) 32,561 staff and hundreds of thousands of people who visit each year – the prison workforce statistics for the quarter to June 2017 has been pulled, it is being revised and the new publication date is confirmed for 17th August 2017. According to a Parliamentary Written Answer in March 2017 there were 2,580 fires in our prisons last year, that’s almost 50 blazes every week. True, many of these are minor – but the fridge-fire in the 4th floor flat that seemingly caused the Grenfell disaster was ‘minor’ when it started, but it still took the lives of around 80 people, devastated the lives of countless others and destroyed the entire building. Firstly we must have a Justice Secretary in David Lidington MP who will jump on this and ensure every CPFIG notice is acted on immediately, also that all IMBs are told of these Notices and that his Prisons Minister is copied in to all such reports and advised in writing by the Governing Governor when the defects have been rectified – we have nothing like that at the moment – although I’m delighted to say that Richard Burgon, the Shadow Justice Secretary, has written to the Justice Secretary demand this. Secondly we must have a joined-up system of Independent Inspectorates – the current system is demonstrably not working. Until we have that in place, HMIP must take with them on inspections CPFIG Inspectors to report on fire safety – and its hardly a novel point. Thirdly, CPFIG must publish all its fire safety reports online – any independent Regulator worthy of the name Independent needs to be seen and heard. Finally, but of equal importance, we must ensure that no one is above the law. The Crown Immunity from Prosecution for breaches of fire safety legislation that currently applies to prison Governors must be removed, responsibility for it then shifted from Governors to HMPPS, and the offences for which the Crown prosecutes, fines and imprisons people like Mr Kimberley, should be made to apply equally to everyone.